Edge-of-your-seat Christian suspense from award-winning author Alana Terry. It's hard to heal from the past when the past wants you dead. ​Kennedy Stern has returned to campus after surviving an abduction, but old scars cut deep. Vivid flashbacks and terrifying dreams paralyze her, threatening to ruin her academic career and any chance she has at peace or happiness. This mental anguish, however, constitutes only a small fraction of her post-traumatic nightmare. A partner in Kennedy’s kidnapping remains at large and will not stop until he has silenced her witness permanently. His violent resolve risks not only her life but also the safety of anyone who tries to help. Kennedy must engage in a deadly battle of the mind as she struggles to stay alive. While fighting on two fronts — one psychological and one physical -- the question isn’t whether she’ll come out of the war stronger in the end. 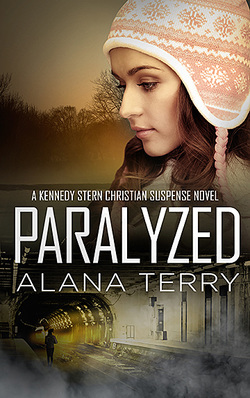 Click below to request your free copy of PARALYZED from multi-award-winning Christian author, Alana Terry. Your free copy will be sent out in mid-November. Imagine you’ve been kidnapped, held hostage, nearly killed, and then finally rescued. Of course, that initial wave of release rushes over you, but then you have to adjust to everyday life. You’re a Christian, and so you ignore the symptoms. After all, you don’t have it that bad. But the panic attacks worsen. The nightmares intensify. Sometimes you wonder if it’s God’s way of punishing you for not being more faithful. If you just prayed more or read your Bible more, everything would revert back to normal. When I started working on Paralyzed, I wanted to explore the different ways Christians react to mental health issues like post-traumatic stress disorder. Of course, there's got to be suspense involved, too. By the time Kennedy's done with semester finals and ready to start Christmas break, the holidays find her trying so hard to keep herself from getting murdered she doesn’t have the time worry about anxiety. ​Why am I giving it away? One of my favorite parts of being an author is connecting with readers. It's hard to describe how encouraging it is to get an email or Facebook post from somebody I've never met. God has blessed me so much by allowing me to write. As cliche as it sounds, being a full-time author is a dream come true for me. I thank God every day for giving me this opportunity. ​Writing is a two-way street, though. It's not the same when you don't have an audience. And that's why I'm so grateful that the Lord has brought readers into my life. This free copy of Paralyzed is my way of thanking you, my readers, for sending me those fabulous emails of encouragement, for suggesting my books to your libraries and book clubs, for leaving your reviews on amazon so others can hear what you think, and for just reading (and enjoying) my work.